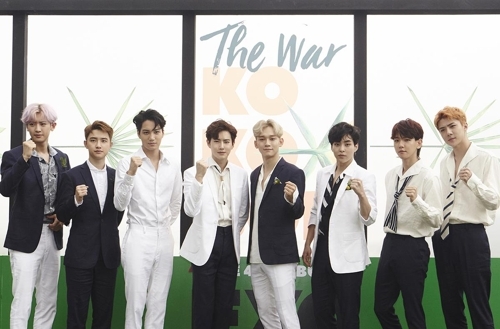 SEOUL, Aug. 10 (Yonhap) — EXO’s new album “The War” has sold about 960,000 copies and is expected to become the K-pop boy band’s fourth million seller soon. The Korean and Chinese versions of the group’s fourth full-length album came in first and second on Gaon’s monthly albums chart released on Thursday, by selling a total of 959,417 copies. The figure breaks down to 808,665 for the Korean version and 150,762 for the Chinese. All of the group’s three full-length albums — “XOXO” (2013), “Exodus” (2015) and “Ex’Act” (2016) — sold over 1 million copies when figures for their Korean, Chinese and repackaged albums were included. “The War” is expected to pass the 1 million mark faster than the three preceding albums judging from the fact that its repackaged version has yet to come out. After its release on July 19, the album swept various music charts at home, also conquering more than 42 iTunes general albums’ charts around the world. It also topped Billboard’s World Albums chart for two straight weeks.